Work is the most unhealthy lifestyle we have, and we cannot get rid of it. We have to work. And 50% of the workforce leave their jobs because of stress. I did too, when I burned out at 26 and again around 39. Those were two periods of time in my life where I made some major life-changes, and they included a change of career both times. A major change of career. So why do we have to? When I first came to the US and realized that I was only going to get one week vacation for the whole year, I was confused about how people got downtime to be human. A friend told me that she changed jobs when she needed time off. That just simply cannot be good for business, I thought. Obviously it isn’t and talent retention is one of the greatest challenges companies have today and it will be one of the big questions to solve around the future of the work. The question about keeping people has turned into a culture movement, but we have to go deeper than that, because culture is not about perks, it is about people. What it really is about is how do we keep our people healthy and happy. Which the next question then is… How do create a Culture of Care™ where people are nourished AT work? Well, it starts with people and what we need. Us, you and I. We have to look at changing the way we work, because how we work isn’t working. Work essentially should be part of what makes us happy and healthy, instead of stressed and unhealthy. Let’s get real. 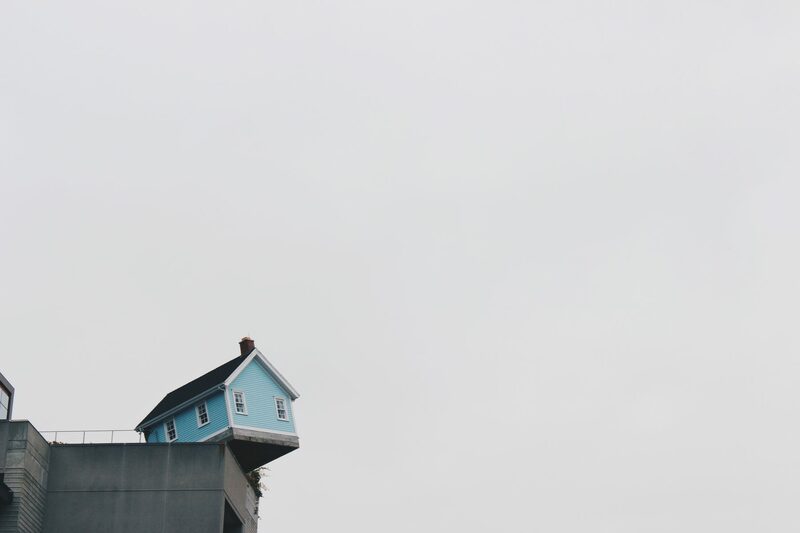 You would not build your house on the edge of disaster, then why do we treat our bodies in such a way that we feel like we could fall over the edge any moment? Over more than 15 years of working with people to reclaim their health, I often hear, that they feel as if they could break down any moment. That they are just holding it together, surviving every day. Why do we do this? Why do we accept this? We should be able to have busy career and be healthy at the same time! I know that the norm in our social culture is that work is supposed to be about stress and pain, and that is just the way it is and we have to keep up. It is in our DNA to think of work as inhumane and something we have to do to get thru to survive, until we can leave work, retire and start living life. Except that doesn’t work anymore does it? To be honest I am not sure it ever worked. There are too many stories about people retiring, only to get sick and die from lack of purpose. We want more from work. So what makes us happy and healthy? What makes you happy and healthy? When I ask that question, most people answer with all the things outside of work that they would like to have time for, and yet we spend most of our time, life, energy and focus… on work. Even when we are not at work. So let’s be real. Work/life balance doesn’t exist in our modern technology driven work. Even if you have iPad time and phone-off alerts, your mind is still on your worries. The mind is always trying to solve the problems we give it to think about and when we are exhausted after a long day of stress, all we focus on is what’s not working. It is like going into a tail-spin and it is wearing us out. What we need is to change the way we work. We need to start looking at work as life. We need to not just consider how we cope and deal with stress but also how we take better care of ourselves and our very own body, because that is how we come out of what I call “perceived survival-mode”. Essentially our very own body, is our most important tool for even getting to work every day and to perform at our best and prevent burnout, we need to rethink performance and productivity by looking at how we support ourselves AT work by bring self-care into the workplace. This is how we can learn to work better, rather than just pushing harder to get more done. It is the inside-out, upside-down perspective of how do we feed what fuels the result – our core human needs which are our most import resource for bringing our best self to work every day. What we need is Work/Life Quality. The first step? Start taking better care of our very own body, so it can take care of you AT work. And it is so basic and simple that we tend to forget or disregard the importance of it. 1. That means water, not coffee, all day long. 2. Eat your breakfast, lunch and maybe dinner. You need the energy for your body and your brain during the day, so that you have fuel when you need it rather than overloading on comfort food late at night when you finally have time. 3. And it means taking short breaks through-out the day, sort of like interval-training for your brain and nervous system: 45-90 minutes on intense work-out as in being focused, 10-15 minutes off. Perfect for that walk to the water cooler to refill your water-bottle and a dash to the rest-room so you can pee and breathe for a few. Start there and tell me how you feel in two week. Look for changes such as better focus, more energy. Keeping your attention for longer, with higher productivity to follow. Better mood and less tired at night. What if we could all work better healthy and go home happy, with energy to spare? What could change? Listen to my recent podcast with Bob Burg for his The Go-Giver Podcast where we talk about self-care… AT work. Taking care of yourself will make you more valuable to everyone around you at work. We’ll look at that in our Thought of the Day. 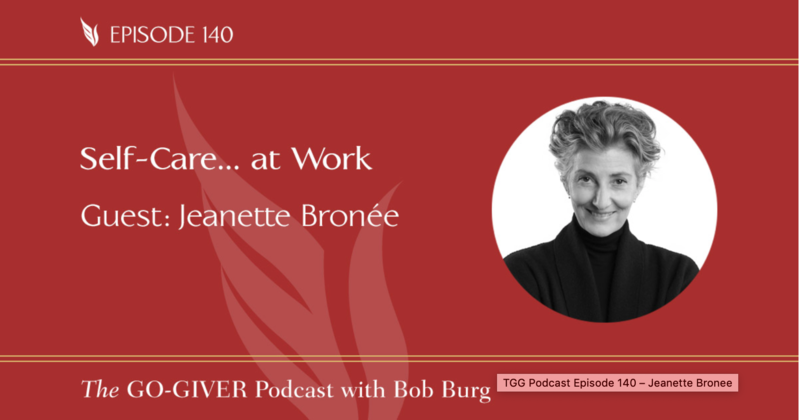 And in our interview segment, Jeanette Bronée shares her mission to make self-care an ongoing part of today’s business culture. That and more on today’s show. The health crisis, and the importance of committing to be healthy. Why both our work and health suffer when we allow work to get in the way of health. How being healthy can make you more valuable to your clients and/or to your employer. How and why Jeanette got started on her mission regarding business and self-care. Why people tend to burn themselves out. The role that a company’s leadership plays in developing a culture of self-care. The (really!) surprising reason why so many people don’t hydrate at work. The value of integrating all our human needs at work, including physical, emotional, mental, and social needs. Jeanette’s experience as part of a U.N. panel. I hope you love it and will subscribe as well. Bob has great conversations with amazing people, who change the world we live in for the better. That is the core of the Go-Giver and Bob does that work in the world Join the movement and check out his books too.